As I reported last week, the Department of Education for Delaware is running a survey on dashboard design. The survey link is here. I have written before about the problem with donut charts (see here). A box of donuts is worse than one donut. Here, each donut references a school year. The composition by race/ethnicity of the student body is depicted. In aggregate, the composition has not changed drastically although there are small changes from year to year. In the following alternative, I use a side-by-side line charts, sometimes called slopegraphs, to illustrate the change by race/ethnicity. There is still a further question of how big a change from year to year is considered material. This is a good example of why there is never "complete data." In theory, the numbers on this chart are "complete," and come from administrative records. Even when ignoring the possibility that some of the records are missing or incorrect, you still have the issue that the students in the system from year to year varies, so a 1 percent increase in the proportion of Hispanic students can indicate a real demographic trend, or it does not. The same chart can be made as an area chart (called a "mountain chart" by Market Insider). The painting of the area serves no purpose here because the area doesn't mean anything. Imagine adding an inch of space to the bottom of each chart. 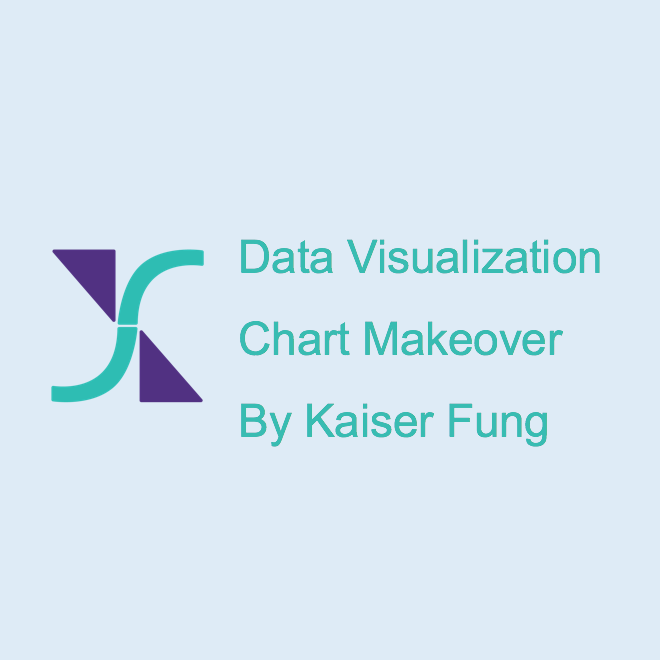 The area chart is sensitive to the choice of the minimum value of the vertical axis while the line chart isn't. Since the data did not change, it's not a good idea for the display to shift perception. That's why I prefer the line chart. I came across this chart on NYU's twitter feed. In a column chart, the heights of the columns should be proportional to the data. Here they are misaligned because an equal amount has been chopped off below 30,000 from all columns. The light purple that I layered on top of the chart presents the correct heights of the columns, assuming that the first column for 2007 indeed properly encoded the data. The dark purple top of each column represents the "lie factor." It is the amount of exaggeration created by chopping off those legs. The lie factor is of Ed Tufte coinage. In a line chart, we are mostly concerned with the changing slope of the line segments going from year to year. The slopes encode the year-on-year growth rates. It turns out that Typepad's spam comment software is pretty aggressive, and several legitimate comments have been sitting in the spam folder for quite a while - interestingly, some of my own comments are also predicted to be "spam"! So you may find that your comment has finally appeared on the blog. Apologies for the delay! The donut chart (right) has nine sections. Eight of the sections (excepting A) have clearly all been bent out of shape. It turns out that section A does not have the right size either. The middle gray circle is not really in the middle, as seen below. The bar charts (left) suffer from two ills. Firstly, the full width of the chart is at the 50 percent mark, so readers are forced to read the data labels to understand the data. Secondly, only the top two categories are shown, thus the size of the whole is lost. A stacked bar chart would serve better here. Here is a bardot chart; the "dot" part of it makes it easier to see a Top 2 box analysis. I explain the bardot chart here.